I was pleasantly surprised to find today, that my site is on page 2 of Google SERPs, at #16, after starting out as not ranking at all, then on page 28 at #286 last friday. This is how I do my indexing strategy for this site. I installed WordPress and all of the plug ins that I was going to use for the site. I also started to modify the site to make it look a little different and to what I wanted. I make a custom header image, which I may still change once I can get my busy Graphic Artist Wife on board(Unless someone want’s to get pimped out with a design and a mention). I wrote 3 posts optimized for the key words I was going for, primary Russian Kettlebell Training. I added the header tags for the 3 main search engine sites and authenticated it with them, and added sitemaps. Bookmarking with Facebook, and Twitter to get some initial traffic, and some people even retweeted and passed the link on. I also did some social bookmarking with Digg, StumbleUpon, and Reddit. Having done that I was confidant that the site would be indexed pretty fast with Google. Added more content including a cool video of a Russian Girl juggling the kettlebells, which got a lot of traffic for the content itself. It was also getting traffic through YouTube for the video. All total was added were 7 articles, and that’s where it stands today so far. I received my content from the article writers I use, and I’ve added a couple articles to Ezine Articles, and 1 to GoArticles.com. So far no traffic from them as they were added yesterday. I expect a couple days to be added and indexed. I also was granted Expert Author Status with EzineArticles.com finally, for all the articles I’ve written and published with them. I’m adding a couple articles a day for the next week, to let the articles be approved and added over teh course of a couple weeks. I don’t want to blast the internet with links all of a sudden, I want to do link generation slowly and naturally. 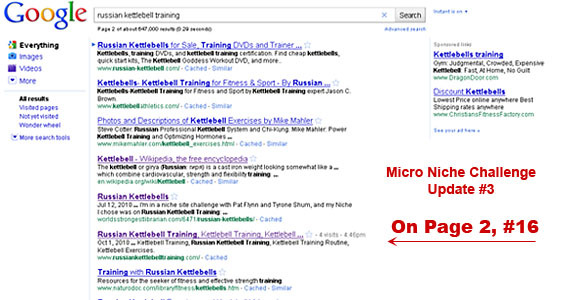 So Friday when I was looking for my site in Google SERPs, I noticed a post about Kettlebells on worldsstrongestlibrarian.com, a blog I recognized from a podcast interview by Yaro Starak. The Blog belongs to Josh Hanagarne, or The Worlds Strongest Librarian. I thought I would drop by and read some and decided to post a comment and talk about the site I was building, and just make myself known. A few days later I was looking for my site again and saw Josh’s site on page two with the link to my site in the description, which means Google indexed that new comment with my link in it, and while it is a no follow link, it may still have some credence. I continued to look for my site and found it on page #28, at #286 position in Google’s SERPs. Yesterday I looked an was happy to see I’ve moved up in position to page #2, at the 16th position. Today I checked again and sure enough I was still there ranking for Russian Kettlebell Training, I also have a counter on the site and saw that I ranked for kettlebell pelvic alignment. For that phrase I was on page 2 of Google, and at position #14. So that’s 2 phrases so far I am ranking for, and will most likely be ranking for more phrases shortly. I’ve been using Market Samurai to find articles that I can re-write for content on the niche site, and that’s been working quite well. I also use Micro Niche Finder for my keywords, as I am not totally versed yet in the ways of Market Samurai. So I will add more content in the way of posts and videos at a rate of about 1-2 posts every other day. I’ll be building more backlinks with article directory submissions, and I’ll go spy on Pat Flynn’s Micro Niche Site on Security Guard Training, and find out where and how he’s getting backlinks. I am confident that I will be doing quite well as my site is already on page two of Google, I just need to widen the number of keywords it is ranked for, preferably keywords like Kettlebell Exercises, Kettlebell Routines, Kettlebell Workouts, etc. I’ve already got affiliate links and banners on the site, but I think I will be putting Google AdSense on there as well, but I am going to wait. I am doing a heatmap on one of my other sites to see where people are clicking. I am going to use this data to decide how and where to put AdSense or other affiliate banners. All in All, I am happy with where things are going with this site so far. I haven’t really done much at all, but I think the way to making a great niche site is to first research your market, and the niche being looked at. While there is a flood of Kettlebell sites out there, I am positive I will still rank well for several keywords and make a decent amount of cash, as well as getting healthy from the workouts I am doing with the kettlebells. Great writeup! Fantastic news that you’ve made it to page 2. My rankings have been sliding up and down for a couple of weeks, hopefully they’ve stabilized by now. Good luck! 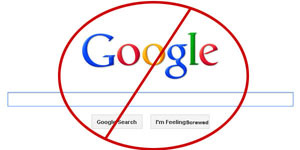 .-= Mike Ziarko´s last blog ..Lessons from Buying and Selling a Website =-. I love reading everyone’s tricks and process for making a micro niche site. You didn’t mention how long it took you to get to the second page. How did you “added the header tags for the 3 main search engine sites and authenticated it with them, and added sitemaps.”? Hi Jess, it took me a little less than 2 weeks to get to the front page of Google. This is because there is little competition for the keywords I used, the url I own and the way I socially bookmark the site. I just built another niche site 3 days ago, and by yesterday I was on page one of Google. because there were hardly any urls in that niche being used with the keywords that are hot, the social book marking of the site to get google to see it quicker, and the keyword phrases people aren’t using. to be honest the new niche site is so under served I am surprised no one else is hitting it, and it’s in a hot cell phone niche. The header tags for the 3 major search engines you get from their sites, in Google webmaster tools, Yahoo Site Explorer and Bing webmaster tools. then you add your sitemap in those control panels also to tell the search engines that you are there and ready to be indexed. .-= Larry Clark´s last blog ..Niche Site Espionage- Spying on the Competition and Finding Niches =-. .-= Julie´s last blog ..The Disadvantages of Plastic Surgery Breast Augmentation PART 2 =-. .-= Steve´s last blog ..How To Make Water Safe To Drink =-. Steve why do you say that? I know I’ve started sites in niches before that I didn’t research them properly and when I got into them realized I did something wrong, or it just wasn’t going to happen. Usually Iw ill leave those sites alone or I will work on them a little here and there, and start using long tail keywords. Steve, I just checked your ranking in google and yahoo. Google you rank at #187 and are on page 19 of google for survival knife. Good Job! now do some backlinking and bring it higher in the ranks. In yahoo you’re #79, keep it up man, your doing good. Thanks to your guidance, my SERPS are hovering around 113 in Google for my keyphrase Survival Knife>. I am 2 and a half months in to the challenge and I believe I can get closer to the first page with some more content and backlinking. .-= Steve´s last blog ..Ka-Bar Becker BK7 Combat Utility Fixed Blade Knife =-. mmm…I need to find a viral video for coupons that would work as well as your Kettle Bell video 🙂 Do you utilize a link wheel for your niche sites or just bookmark the main website? .-= Sam´s last blog ..Bread Coupons =-. Less than two weeks for a front page spot is pretty impressive. I have been playing with some micro sites lately and I think the overall idea is very easy to grasp. In the past I have focused on higher traffic, higher earning sites which is great, but can take months to get a decent ranking. My thought was that if I did a combination of high earning blogs and quick low competition blogs, the low comp. 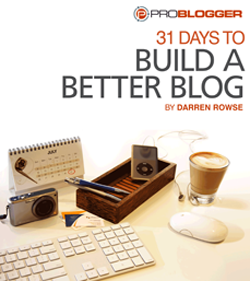 blogs would add some income while I am waiting for the rankings to come up on the more competitive niches. Still in the testing phases, but I will let you know how it works out. Michael @ the phlebotomy training site. Did you find much benefit, in ranking terms, from having links on Facebook and Twitter? Great posts! I have been at this for about 3 months, and have gone through the google dance (sandbox) a couple of times now. Got to page 1 google after 1 month, then dropped into oblivion. Got back to page one, then 10 days ago, off to the twilight zone again? Very frustrating. Larry is right when he says you have to eventually realize when a site is not working and move on, or divert your energy into better prospects (sites). I just checked your niche site and saw that you are now on the front page. I just started out, and wish I would be anywhere on the first two pages. I guess I need to follow your example, and hopefully see mine moving as well. Cool beans, Larry. Glad to see that you’ve got the site up to the first page. I too have been following Pat’s adventures in this area and have found them really inspiring. You seem to be doing an equally fine job yourself. Question – did you find any drop in your sites’ PR from Google recently? I dropped from 0 to n/a on a couple and also had one sandboxed. Is this common for others, especially recently? p.s. the kettlebell video of the girl is sweet! somehow, it is better that they are on a beach. I did see a drop in some of my sites that I hadn’t backlinked much to, but over all most of my sites didn’t change. I did however start a new experiment which I will be posting in the next couple of days. The video I like most is the Russian girl doing the ballistic kettlebell juggling. This is great stuff. I just started my niche site a few months ago when the niche site challenge opened up on Pat Flynn’s blog. I’m glad to see you took part and have done well. No, I did not participate in the challenge since I was a complete newb…but I’m learning quick so hopefully I could participate when another challenge like this rolls out. I am new bloger. I heard about micro niche sites but never saw how it is. I deficult to do ? Now i have some sites but with wordpress.